I'm guessing by now you've listened to Mike and EB's Hot or Not show, covering various topics in the amusement industry that are on the fence for a lot of us enthusiasts. For the record, I really want a mobile space shot ride. Anyway, I think it Hot or Not is a pretty good idea, and I figured I'd throw together a list of what I think are the hottest and coldest things in the industry right now. But please keep in mind that this is just my personal perception, so if you're not a nerdy coaster boy from the arctic tundra-- I mean, suburban Chicago--then feel free to throw these opinions to the curb. What can you say about Rocky Mountain, other than they're quite literally re-defining coasters as we know them. I think everyone shared the same reaction when they first saw pictures of the overbanks and double-barrel roll on Outlaw Run. And now it seems like Six Flags can't empty their pockets fast enough to get more Rocky Mountain coasters. Behind the scenes is Alan Schilke. Who is Alan Schilke, you may ask? He's one of the minds behind coasters such as X (now X2) at Six Flags Magic Mountain, Iron Rattler, New Texas Giant, and Outlaw Run. The man is a true innovator, and it seems like his work is only getting better. I've got a wacky idea. Let's take what was previously a tame family ride, and raise it 400 feet in the air! Windseekers were already kind of creepy to me. You're spinning on a single metal arm, that's pivoting on a steel pin with 300 feet of sky between you and the ground. Now take away that steel arm and replace it with chains? I haven't experienced a Starflyer yet, and I would definitely ride one. But wow these things look terrifying, and they're popping up quite frequently any more. Speaking of terrifying... I'm not sure what's a higher number: the amount of stairs to climb atop this absurd structure, or the number of times I'd have to re-consider before getting aboard one of those rafts. I'm all for tall roller coasters. But let's be honest. If this thing was a coaster, it'd have an over-the-shoulder restraint with a seatbelt to boot. Instead we'll be zooming down a slippery slide with nothing but open air and a few short walls around us. How long until water slides become scarier than coasters? I think Cedar Fair is onto something here. Last year they drew a packed house for their Gatekeeper media day by opening it up to card-carrying members of Coaster Clubs. Sure, they provided food for a lot more heads as a result. But they also received immense amounts of instant, and free, publicity thanks to social media. Now Kings Island is following suit, and I would assume that future events will take place at other parks. Hear me out here. I know we've seen 3 brand new ones in the States in the last few years, and people seem to like them. I've been on all three, and they're certainly fun rides. But honestly I don't get the gimmick. Sitting outside of the track is kind of neat I guess. But I'd rather hang below it on a nice invert to get that feeling of openness. In my mind, watching the trains careen through the course from the ground is one of the bigger perks of these rides. I had to address this one, having grown up in Cincinnati. So Kings Island will always be my true home park. With that said, come on, Kings Island. The first female-inspired coaster? 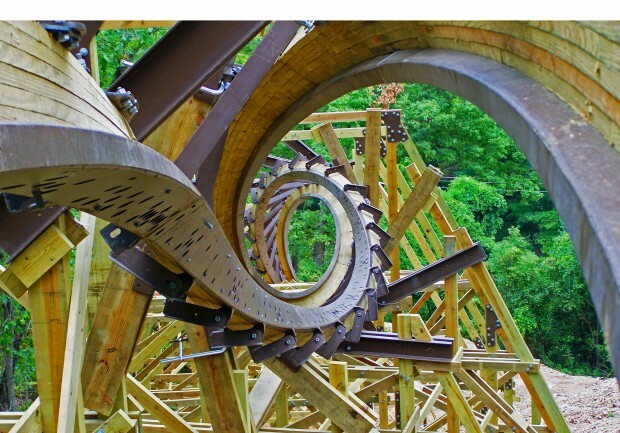 Banshee will be a world-class B&M Invert. The coaster markets itself. Also, does that make Rita: Queen of Speed an unfortunately-named male coaster? On that note I'll wrap this up. The amusement industry is ever-changing, and every year we see new trends developing. In my mind (as described above), some are better than others. Regardless of the trends, a new park addition is almost always a good thing-- unless, of course, that thing is a Topple Tower. What is destroying the park experience for you?